A few years ago I saw footage of one of the Apollo moon missions flying away from Earth and the sight of seeing a piece of man-made technology set against our shrinking planet had a slightly discombobulating affect on me. It signified something huge, that my brain couldn’t quite comprehend. Although I can intellectually understand that we have travelled in space, I only really get the proper immensity of it when I see things like that. 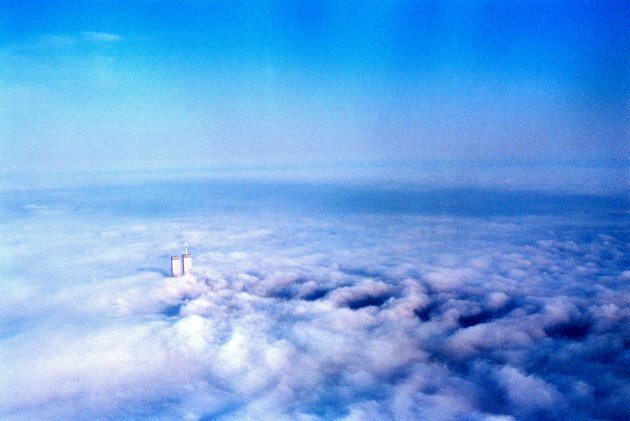 This photo of the World Trade Centre Twin Towers, taken a few years before their destruction, had a similar affect when I came across it yesterday. There is something genuinely awe-inspiring about a scene like that, and at the same time really surreal. A picture paints a thousand words isn’t really accurate. Sometimes no amount of words can get remotely close to describing a picture. The story of this remarkable shot can be found here.